On March 24, 1989, an oil tanker called the Exxon Valdez crashed into a reef in the Prince William Sound in Alaska, spilling 11 million gallons of oil that devastated the highly populated ecosystem. Attempts to clean rescued animals and scrub oily rocks were of little help and actually killed some organisms. Bioremediation was more successful. Ten weeks after the spill, researchers from the U.S. Environmental Protection Agency applied phosphorus and nitrogen fertilizers to 750 oil-soaked sites. The fertilizer stimulated the growth of natural populations of bacteria that metabolize polycyclic aromatic hydrocarbons, which are organic toxins that were present in the spilled oil. Over the next few years, ecologists monitored and compared the areas that the bacteria had colonized to areas where they did not grow, and found that the level of polycyclic aromatic hydrocarbons fell five times faster in the bioremediated areas. Another environmental disaster being treated with natural bioremedi-ation is the pollution of the Hudson River in New York with polychlori-nated biphenyls (PCBs). General Electric Corporation deposited these compounds along a 40-mile stretch of the river between 1947 and 1977. PCBs were used to manufacture hydraulic fluids, capacitors, pigments, transformers, and electrical equipment. PCBs come in 209 different and interconverting forms, and the toxicity of a particular PCB depends upon the number of chlorine atoms it includes. Debate rages over whether it is better to remove and bury the most contaminated sediments, or to allow natural bacteria in the river to detoxify the PCBs. The bioremediation of the Hudson River is occurring in three stages. First, buried anaerobic bacteria strip off chlorines. In the water column, aerobic bacteria cleave the two organic rings of the PCBs. Finally, other microorganisms degrade the dechlorinated, broken rings into carbon dioxide, water, and chloride. While the process effectively detoxifies the PCBs, it is a long-term process that can take up to two centuries. 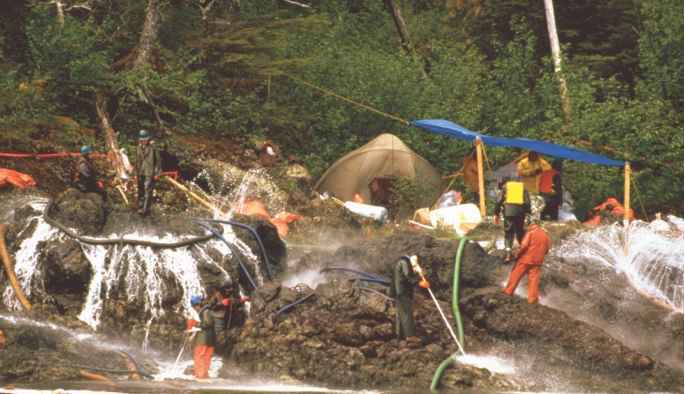 Cleanup crews use hot and cold high-pressure water jets to clean the rocks following the Exxon Valdez oil spill in 1994. This cleanup strategy was followed by the introduction of fertilizers to some areas of the spill, helping to encourage the growth of bacterial colonies.